Bon bini na Korsou! 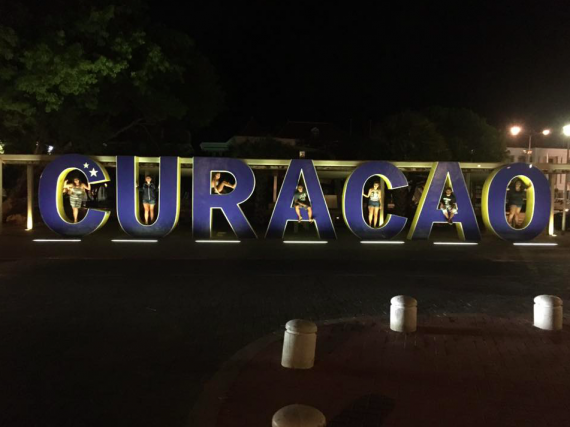 Or Welcome to Curacao! This Alternative Break trip was completely legendary. 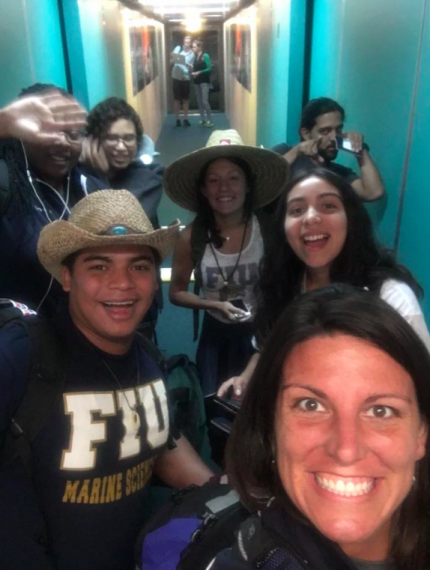 Before our trip, we were all very curious and excited because most of us had never even heard of Curacao, and this was to be the first trip ever by a university to the island. 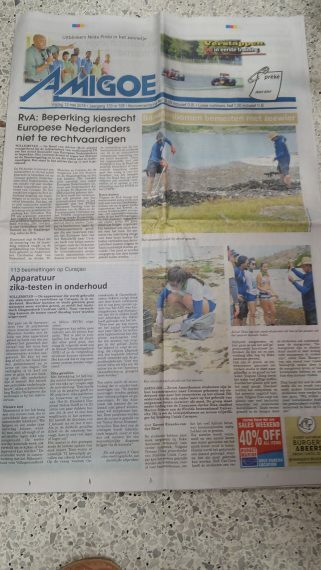 Our goal on the trip was to clean up trash in Curacao and get the local community more involved in projects like this in the future. 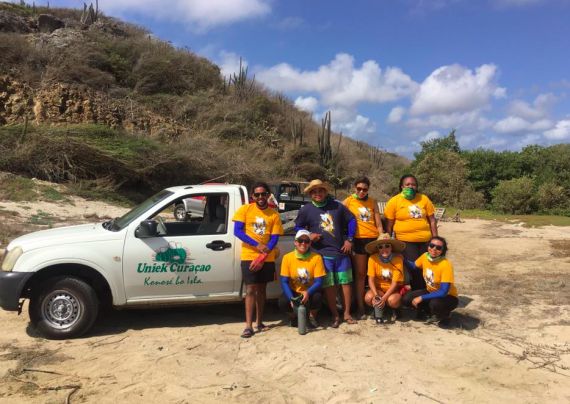 During our trip, we mainly worked with Uniek Curacao, an organization on the island that helps manage and preserve the natural sites through cleanups and ecotourism. 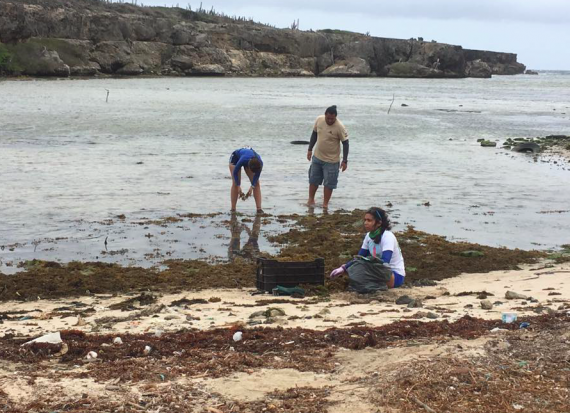 They really emphasize community involvement; for example, Uniek Curacao sought help from elementary school students to help make pods for propagules (mangrove seedlings). Curacao is unique because of the trade winds. The island gets a lot of trash on its shores from other places like Venezuela. When the coast lines are littered with trash and brown algae, it ruins the natural habitat, kills plants and prevents wildlife from reproducing. It also opens the possibility of developers who want to use the land for hotels to come in. 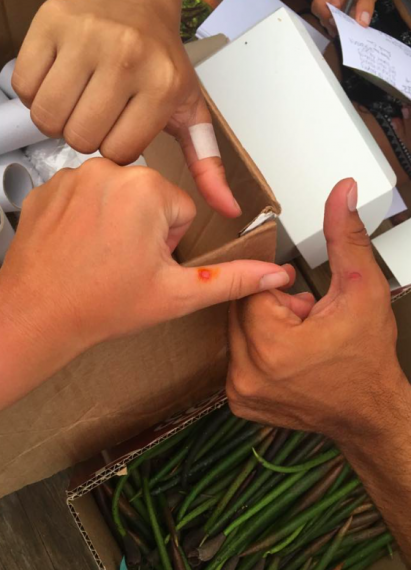 Terence Ching and Javier Diaz helped us understand the importance of the work we did; we definitely all saw it. The first day we visited the sites. 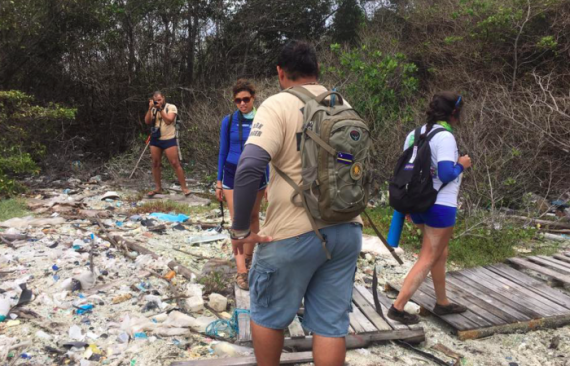 It was really great because we toured the island a bit and saw where we were going to be mainly working – Boka Ascension, a natural preserve and cove where a lot of trash builds up. 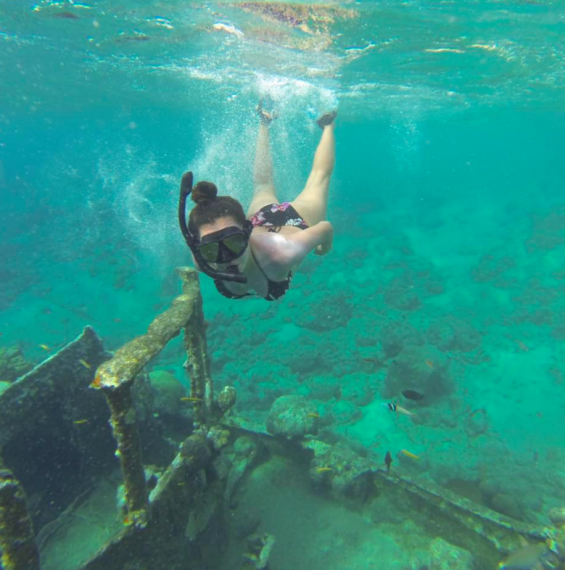 Here we saw the sargassum (brown algae), trash and all the work ahead of us. We also saw something very shocking. Javier had explained to us what it was, and we saw pictures of it as well, but nothing compared to being there. In a cove at the end of the waterway was a wasteland of microplastic. Microplastic is pieces of plastic, like water bottles or other trash, that gets torn down in the ocean over the years until it becomes so small it’s almost impossible to pick up. There was so much microplastic, nothing was alive there – not even gnats. Because of the brown algae and microplastic, sea turtles and fish can’t spawn on shore. The water becomes polluted and even the mangroves can’t breathe because of the trash and brown algae. 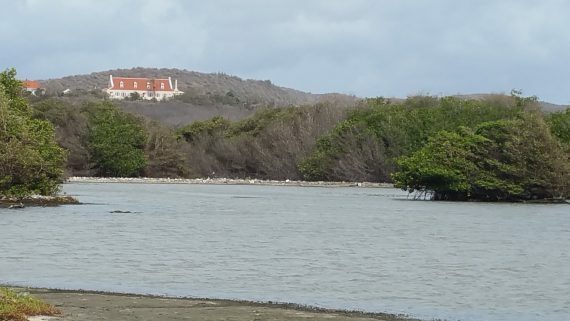 The mangroves are an important part of the ecosystem here. They clean chemicals from the water; serve as a nursery for fish; hold trash to prevent it from spreading; protect the island from water surges; and give nutrients to the soil. Between the mangroves and pollution, the apparent death at the end of the waterway impacted us all. Silence overcame us when we walked away. 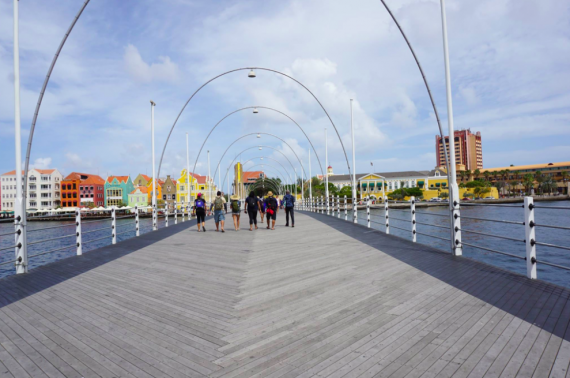 Curacao needs a lot of saving and innovative ideas for its survival. 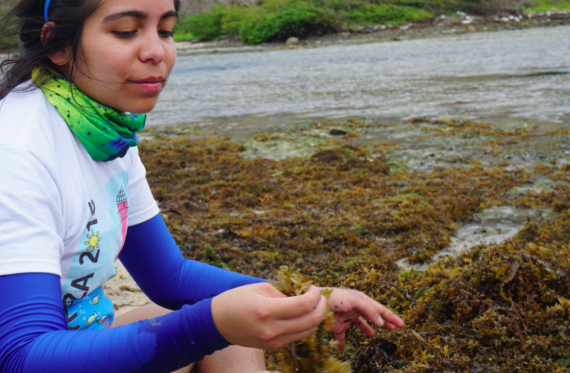 The second day at the sites was a lot of work because we picked up fresh sargassum (brown algae) to make fertilizer for the farm we were lodging at. If you pick up the algae and clean it, and let it sit for a month, it can serve as fertilizer. This is not only a cheaper option for locals, but it also removes it from the shore and recycles it in a useful way. Over the years, there have been more blooms of brown algae, so this was an important part of the trip because this would test out of if the fertilizer actually worked here on the island. It also allowed us to give back to the farm that helped us out so much. Then we went back to the farm to go cleanup the sargassum and had our first home cooked dinner. Our third day we went back and worked for about five hours directly under the sun. 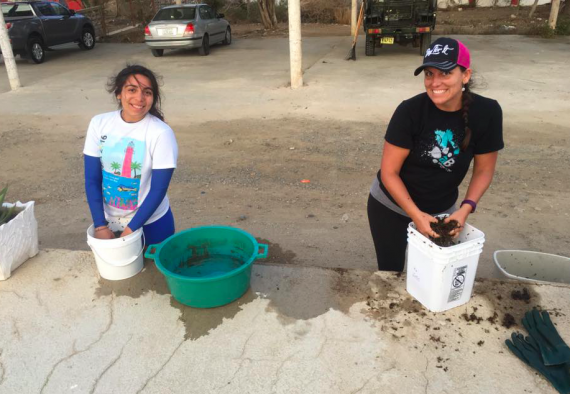 We picked up about 1,200 pounds of trash and dead seaweed. We were all completely exhausted at the end. But we did a lot of work for only 10 people! 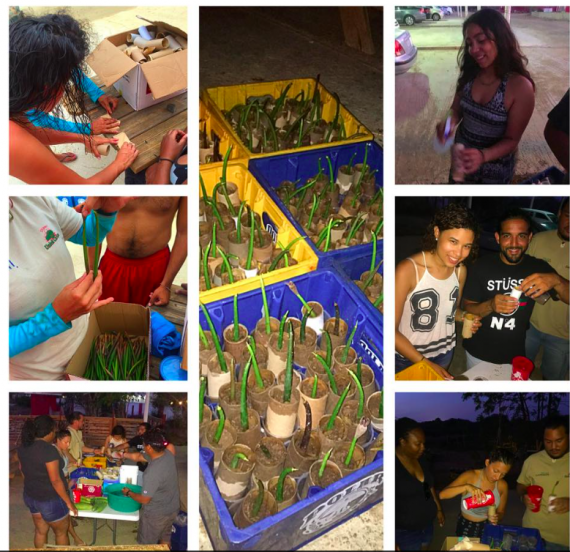 Then the fourth day, we got up early after camping and planted more than 281 mangrove propogules. This will help repopulate the mangroves that have died because of the pollution. 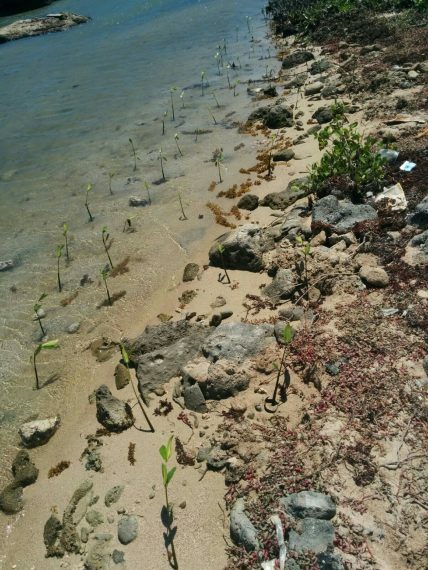 We also prepped 214 mangrove propagules that can be planted later. At the end of the day, site leader Javier rewarded us with some much deserved fun! 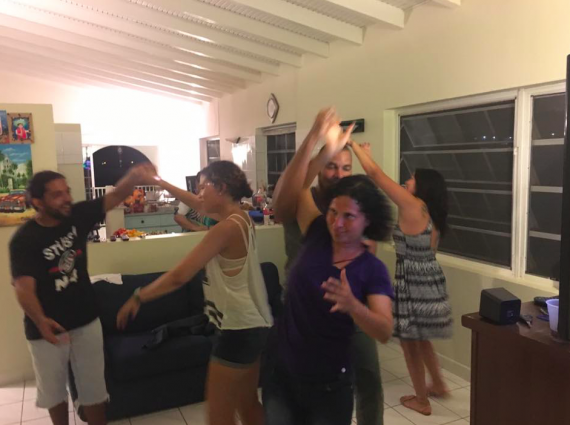 We got to see the city at night; we went snorkeling, cliff diving, tried some okra soup, and most importantly, Javier’s family really made us feel at home. We also got to make some lifelong friends with not only the people but with the island itself. It is such a small island but it is so rich with history and there are so many reasons why this place should be taken care of and preserved. This microscopic island, which you can barely see on the globe, illustrates how quickly we can destroy nature. Nature gave us everything, yet we are ruining it with our greed and lifestyle; we have to stop, take a moment and stop our selfish ways and give back – immediately. 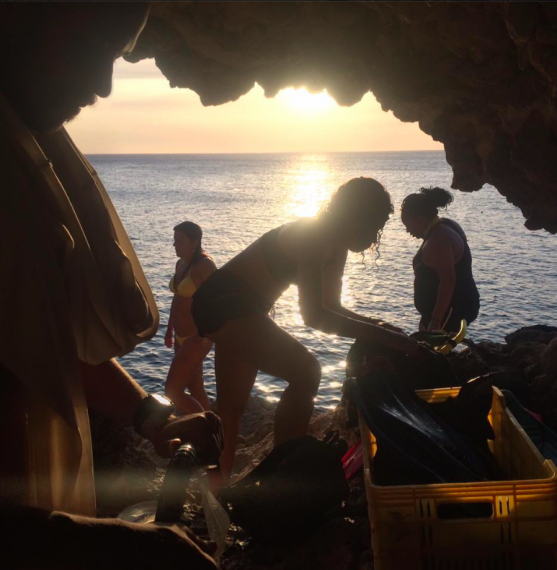 Senior marine science major Javier Diaz, who is from Curacao and was instrumental to planning the trip, contributed to this article.